Rhubarb plant for sale is best purchased and planted in the spring as soon as the soil is workable. This plant is typically grown from one year old rhubarb crowns. Healthy rhubarb plants can yield harvests up to 5 to 8 years or even longer. Location – Rhubarb plants are best grown in areas where the ground freezes in winter. They need an extended chilling period to produce a crop of stems. The usual temperature requirement for this plant is below 40 degrees. They do not do well in hot, dry weather. Choose your planting site carefully as the rhubarb plant do not transplant easily. Select an open site with full sun or light shade. Soil – Choose a slightly acidic, well-draining soil which is rich in organic matter like well-rotted manure or compost. Ideal soil pH is 6.0 to 6.8. 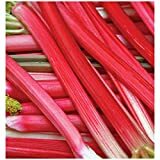 Plant your rhubarb in raised beds if you have heavy clay soil. Plant the roots with the crown bud 2 inches below the surface of the soil to prevent rotting. Mulch the soil with a 2 inches layer of compost, straw or shredded bark. Water – Water the crown after planting. Keep the soil moist throughout the growing season. Space your rhubarb plants 24 to 36 inches apart. Much smaller spacing than this could result in a diminished crop and increased likelihood of spreading disease. Fertilize – Rhubarbs respond well to fertilizers. 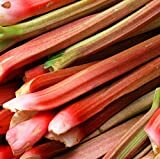 Feed your rhubarb plant at the time of planting and every couple of weeks within its growing season. Do not put chemical fertilizers when planting because nitrates can kill your rhubarb plant. Lightly sprinkle with a high nitrogen fertilizer on the first spring frost. Pruning – Remove seeds stalks and flowers as soon as they appear. During the first year of planting, avoid picking the stalks. Food from the leaves is needed to nourish the roots for the next year’s growth. This will shift the plants energy to producing better quality stems. After harvest, remove all the plant’s debris. Thin the clumps every 4 to 5 years or when the stalks are getting smaller and spindly. Do this by digging around and trimming the crown down to 4 or 5 buds. Harvesting – You will not harvest on the first year of planting but you may do so lightly on its second year. Remove only a few stalks from each plant. On subsequent years, you may harvest stems freely. Take care not to remove more than 1/3 – 1/2 of the stalks to ensure continued production. Only choose stems that are 12 to 18 inches long and reddish in color. Remove the leafy portion and the base of the stem. Only use the colored stalk for cooking because its leaves are poisonous. You can harvest for 8 to 10 weeks on mature rhubarb plants. Matured established rhubarb plants can be coaxed into early production by covering plants with clear plastic in the early spring, before the crown starts to grow.